Featuring a Carbide Size Button in the full length sizing die and the Bullet Seating Micrometer on the seating die. 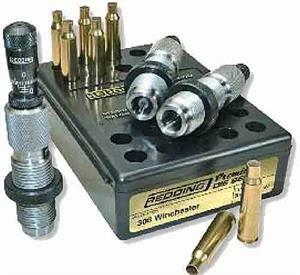 Following the introduction of Bullet Seating Micrometers for our standard series of seating dies, our customers have been asking for complete die sets with this added precision. We have now added two popular upgrades to a select group of dies to create the new "Premium" Die Sets. The upgrades include combining a Carbide Size Button in the full length sizing die and the Bullet Seating Micrometer on the seating die. The "Premium" DeluxeThree (3) die set; contains the "Premium" two (2) die set (described above) With the addition of a standard neck sizing die. Made to Order At The Factory, Allow 1 to 2 weeks for delivery.